Looking for a LIFEPAC resource to help you keep track of your student's goals? If so the Goals Check Record from Alpha Omega Publications is just what you need! This handy checklist pad contains 50 columned pages for logging accomplished and missed student goals. Easy to use, this checklist for the LIFEPAC Alpha Omega curriculum is divided into sections for each day of the week and provides space for recording goals for each studied subject. And columns are colored in blue and white so you can easily read across each line. Isn't that convenient? Plus, you can use this resourceful pad for logging goals for multiple students too! But theres more! Using the time-saving Goal Checks Record, you can easily record your student's progress and efficiently locate missed assignments or problem areas. In addition, as you complete each sheet, you can simply add them to your student's records so you have permanent, easy-to-find documentation for future reference. Isn't that reassuring? So don't wait any longer. 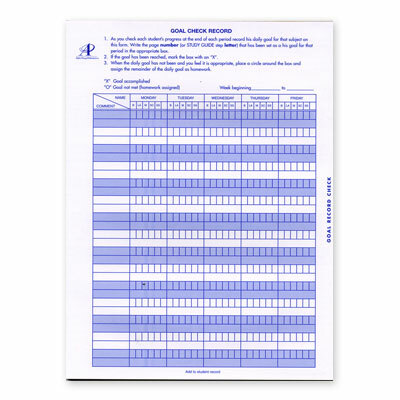 Set goals for your homeschool student and record them accurately with the Goals Check Record! Order yours today.